Cuban-Puerto Rican soprano Megan Barrera is a native of Miami Florida, and is an active performer of both opera and concert repertoire. In 2018, Ms. Barrera was the first prizewinner of the Certamen Nuevas Voces Ciudad de Sevilla, Spain. She was also a prize winner of the Concorso Lirico Premio Koliqi in Milan, Italy and the International Vissi D’arte Competition in the Czech Republic and a finalist in the XIV Concurso Internacional de Canto "Luis Mariano" in Irun, Spain. 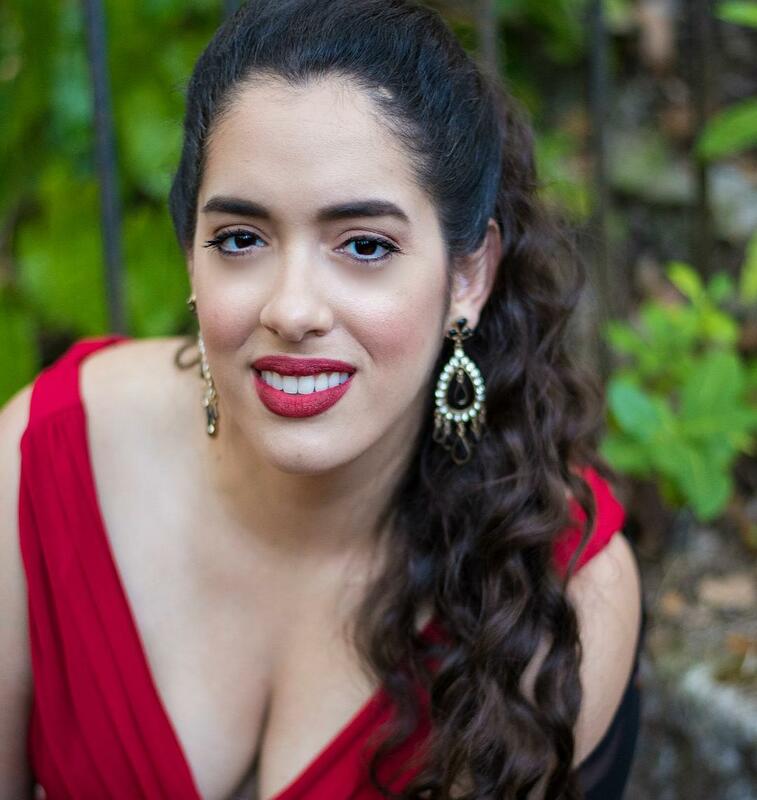 In 2017, Ms. Barrera was the first prize winner of the Saint Petersburg Opera Guild Competition in Florida and the Rochester Oratorio Society Classical Idol Competition in New York. In 2016, Ms. Barrera was awarded the Munday Encouragement Award at the Jensen Foundation Vocal Competition. In 2018 and 2015, she was a Semi-Finalist at the Marcello Giordani International Voice Competition. Ms. Barrera has also been awarded a grant from the Anna Sosenko Assist Trust. She was recently seen as a soloist of the Asociación Sevillana Amigos de la Ópera winners "Gala Lirica" concert in the Joaquín Turina Concert Hall of Seville. In 2017, Ms. Barrera's comedic timing as Berta in Miami Lyric Opera's production of "Il barbiere di Siviglia" received rave reviews. She also performed in Vero Beach Opera’s Viva La Zarzuela Concert. A frequent performer in South Florida, Ms. Barrera is a founding member of Miami’s Distilled Opera at the Villain Theater. Prior to her relocation to Berlin, Germany she would regularly sing with Distilled Opera, Temple Beth Am Opera Concert Series, and the Faculty Recital Series with New World School of the Arts in Miami, FL. In 2016, Ms. Barrera was an Apprentice Artist with Sarasota Opera. In 2015, Ms. Barrera was praised for her portrayal of Donna Anna with the Miami Music Festival. She is most known for her “colorful acting and great personality” in the role of Norina with Miami Lyric Opera and Wichita Grand Opera. Other operatic roles include Pamina in Die Zauberflöte with Festival South and Opéra Louisiane, and Musetta in La bohème. Ms. Barrera has also sung musical theater roles, making her Natchez Festival of Music début, singing the role of Lilli in Porter’s Kiss Me Kate. Ms. Barrera holds a Doctor of Musical Arts Degree and a Master of Music Degree from Louisiana State University where she was the recipient of a full tuition scholarship. She completed her Bachelor of Music Degree at the University of Miami where she was also a recipient of the Bertha Foster full tuition scholarship. New Orleans, Louisiana based clarinetist Ben Redwine is equally comfortable playing Brahms or Ellington. He is devoted to the performance of new classical music and America’s classical music—jazz! Ben retired from the US Naval Academy Band as principal Eb clarinetist, and has taught at two major US universities. Ben holds a Bachelor of Music Education from the University of Oklahoma, a Master of Music (clarinet performance) from Louisiana State University, and a Doctor of Musical Arts (clarinet performance), with a minor in Latin American Music from The Catholic University of America. Since relocating to Louisiana in 2016, he is a regular performer with the Louisiana Philharmonic Orchestra (New Orleans), Baton Rouge Symphony, and leads his own jazz ensemble, performing throughout the southeast United States. Ben has been a featured soloist on four continents, and has nine feature recordings on CD and DVD. He is a Selmer Paris and D’Addario performing artist, performing exclusively on their wonderful products and mouthpieces that he makes! Brazilian pianist João Paulo Casarotti is the Coordinator of the Piano Area of ​​Southern University A&M College in Baton Rouge, Louisiana, as well as Artistic and Pedagogical Director of the Encontro Internacional de Pianistas de Piracicaba, Encontro Internacional de Pianistas doVale do Aço (Timóteo, MG) and Piracicaba International Piano Concerto Competition. Dr. Casarotti maintains an intense activity as an interpreter, pedagogue, researcher, and clinician. Casarotti earned his Doctoral degree in Piano Performance from Louisiana State University, a Master's Degree in Piano Performance and Piano Pedagogy at Temple University, a Master's Degree in Piano Pedagogy from the University of North Dakota, a Bachelor's Degree in Piano from the Universidade de São Paulo (Brazil), the Piano Diploma of the Escola de Música de Piracicaba “Maestro Ernst Mahle,”and the Performance Certificate of the National Academy of Music of Sofia (Bulgaria). Dr. Casarotti performed as soloist and chamber musician in Brazil, the United States, Thailand, Taiwan, South Korea, Bulgaria, Argentina, Chile, Uruguay and Paraguay. He also performed as a soloist for orchestras in Brazil and the United States. His areas of expertise include Taubman Technique, Alexander Technique and Piano Wellness; the teaching of online piano and the pianistic work of the Brazilian composer Ernst Mahle.